Wolverine, that immortal Canadian badass, has become a staple of comic books. 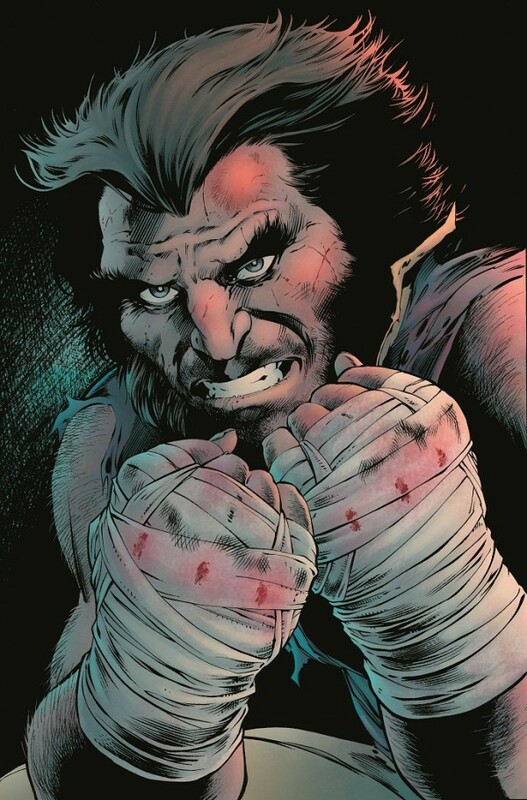 Ever since he first appeared, and especially since X-Men opened the doors to the modern waves of comic book movies, he’s become one of the most identifiable heroes in Marvel’s stable. But while the superhero story has nearly become its own genre, the X-Men are still science-fiction. Accordingly, Paul Cornell has decided to follow in the tradition of SF writers before him and write a story based on a single question. It’s a simple thought experiment: what would Wolverine do without his healing factor? This is an oddly quiet issue for a Wolverine series, there’s no villain to beat, there’s no world in danger, there’s no claims of being “the best there is at what I do”, but one has to wonder exactly what it is that Wolverine ‘does’ without his mutant powers. It’s kind of interesting to notice that, of the surviving major X-Men, the three most famous have all lost a portion of their powers. But where Magneto quietly mourns and Cyclops throws himself into his cause and his training, Wolverine simply cannot regain what was lost to him. At over a hundred and thirty years old, Wolverine’s healing factor is a part of him in a way that even Cyclops’ optic blasts can’t match. Cornell avoids the temptation to use this as a way to even the odds against Wolverine, instead giving us a rather cerebral look at what it is to have something you always depended on taken away. As much as there’s been physical damage, the real hit is an emotional one. Logan has never had to worry about his own mortality and, like a child who never got sick, doesn’t know how to handle it. Cornell shows us a myriad of clever ways that Wolverine’s life has changed., while still building the…intelligent virus from the microverse plotline (if that sounds silly to you, don’t worry, Hank McCoy agrees). While some readers might expect Wolverine to get himself quickly and seriously injured, it’s even more interesting to watch him consumed by paranoia. The idea that Logan’s been keeping a list of ways that his adamantium skeleton won’t protect him is highly telling. Cornell does a good job of balancing the subtle and the stated in this issue, making Wolverine’s worries clear, without giving everything away. There’s also some great cameos in this issue. Nick Fury Jr. returns after the events of the first arc, but we also get to see Beast, Storm, and even Thor’s reactions to Wolverine’s newfound mortality. Each of them are written well, and with differing strengths and weaknesses in relation to their old ally. Fans of Nightcrawler will even feel his presence hanging over a page or two (though it is rather odd to hear Logan mourning that he’s finally accepting that Kurt won’t be coming back mere days after his revival was announced). Cornell’s script overflows with character, but though the ideas are solid, there are occasional problems. There are some decidedly wonky bits of dialogue. Talking to Fury, Wolverine tells him “I am today thinking of buying a safety razor”. The lack of a contraction is weird enough, but (especially without commas) it just feels like a broken sentence. If it were a one-off it might not be worth mentioning, but such strange turns of phrase are peppered throughout the issue. Marco Pierfederici provides the pencils for this issue, bringing great character into Logan. Pierfederici’s art really gets across our pugnacious protagonist’s newfound fear. Every action is affected, from the way he stands to his hesitant gestures. Pierfederici is an artist who seems to specialize in the illusion of motion. The panels in this issue frequently feature their subject halfway into an action, depending on clever tricks to convince us of what comes before and after. It’s fairly remarkable that there aren’t more panels where the action is unclear, but so it is. You’ve probably already encountered the downside to this phenomenon though, when you’ve had a picture taken of yourself, only to find that you hate how you look. The human body goes through all manner of intermediate phases (especially in the face) to create the continuous movement our brains process into something we perceive as a single action. Similarly, though characters seem attractive enough at a glance, subsequent reads reveal harsh lines and strange quirks in their appearance. Thor receives the worst of this, but it’s present in most of the characters. Whether you like that style or not is a matter of personal preference, but there’s no denying that it takes serious skill for such artwork to succeed at all. With a new movie opening this week, Cornell and Pierfederici give us a chance to slip in and get familiar with the modern Wolverine. It’s a sweet, funny issue that gets us used to the new status quo, but isn’t terribly necessary. It’s clear that Cornell was thrilled to have a month to just play with Logan’s reactions, but, for some, that won’t be enough to warrant a four dollar purchase, Though opinion will always be split over more experimental issues of a mainstream book, I enjoyed Wolverine #7 a lot. Wolverine’s solo title takes a break from being a superhero comic to give us a nice look at Logan’s humanity. « How Hard is it to Write a Wonder Woman Movie?